Your show time should be no more than 45 minutes. Short shows will make you more money. For every minute you go over 45 minutes you are losing a dollar of sales!! When I say your ‘show’, I am referring to your official presentation. From the time you start talking until the time you stop talking should be no more than 45 minutes. That also implies that your show has an official start and stop. The guests actually are aware that you have officially started and officially ended. For some reason everyone thinks that their company is different. The Direct Sales Association has determined in studies that when your show presentation is longer than 45 minutes your sales will drop. Many sales consultants have a huge list of reasons why their direct sales company is different. It doesn’t matter who what the company or product line is, the objections are the same. Everyone has the same reasons why this doesn’t apply to YOUR company. Sales professionals selling: make up, plastic containers, food and food mixes, kitchen tools, romance enhancement, vitamins, you name it everyone thinks that their direct sales company is different. To Busy To Host A Home Party? If someone says they are too busy to host a party that usually means that you did not give enough value for their time!! Are you taking up too much time? Think through your home party presentation and make a plan to create better value for your guests time. If anyone has ever said to you, “I am too busy…..” to host a show or be a sales rep, then you really need to look at the length of your show. When someone says “I am too busy”, it doesn’t mean they are busy. What it really means that you have not given them enough value for their time. Time and Fun are the two biggest commodities in the 21st century. They are not too busy to watch TV, go to the movies or sit on a lawn chair all night and watch a soccer game. When your show time creates great fun and provides value-packed time, then people will be coming up to you asking if they can host a show. If there is one thing that people will not tolerate, that is being bored. Don’t rule yourself out, just because you think that your company is different. Less is better for everyone because we all have full lives. By keeping your show to 45 minutes and providing great value for that time, people will spend more money and want more time with you. When you give them more value in less time they will see the value of hosting a show. They had fun; they learned and had a terrific time. Your calendar will fill up and your sales will skyrocket. 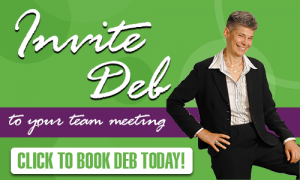 Deb Bixler is often referred to as the party plan expert. Learn more about start a home party plan business so that you are guaranteed success!